Four days. Nine Narwhals. Four rooms. A whole load of stationary. I know, it sounds like the new Saw film. Fear not. The pensive intensive. Am I pleased that it rhymes? Yes. Was it actually a pensive intensive? Erm…Parts of it were. I wouldn’t say being pensive was a defining feature of it. We actually spent a fair amount of time ‘doing’ as well as ‘thinking’, but ‘the doing intensive’ wouldn’t rhyme, so I’ve plumped for pensive and we’re sticking with it. Before we go any further, I must make you aware that I am under strict instruction from my fellow Narwhals to keep our show under wraps. What that does mean however, is that whenever I type ‘Our show is about …’, I get a real buzz before backspacing hastily. As you can tell, I like to live on the edge. So, yes. The intensive (the pensive one) was across four days, the 23rd-26th March. I know that looks like three days, but trust me, it’s four. I counted with my fingers. Having participated in various peer-led workshops in January and February, we came in to this week with a rough idea of what we wanted our show to address, and a range of research that we had each carried out beforehand. The Thursday was largely spent sitting around countless sheets of paper with a myriad of post-it notes and sharpies. After we had each shared our research and ideas, we tried to sort it all in to three separate groups; Form, Theme, Story. The Narwhal method. (That was a joke, we know people use those three categories all the time, please don’t sue us). Once we had sorted them, we began putting together the ideas for form, theme and story that complemented each other and we were left with a grand total of three ideas for a show. A productive day one. A pensive one, some may say. Friday consisted of three parts. In the morning, we were around the table once more, putting together a very loose narrative for each of the ideas. The intention being to cherry pick bits and pieces from each narrative that we could then try and put on their feet. At this stage, we eliminated one of the three ideas. Two to go. In the afternoon, we were more practical, approaching the ideas from various different angles; character and music primarily. We all had a favourite, but we kept that to ourselves. The evening came and it was time for the Narwhal Ensemble social. We met up with Jane and Nik at Pizza Express for food, followed by a trip to the bowling alley. I think the important thing to remember about the bowling, is that it was a way of building on the strong bonds we have already formed as a company (I won), and that it is not about the winning (Three strikes and one spare), it really is all about the taking part (finishing with a scintillating score of 125). Was I disappointed that we didn’t end up in Pryzm? Yes. But I’m not bitter. Rumour has it they were doing three Jaeger bombs for six quid. But it’s fine. As I said, I’m not bitter. On Saturday we were in Rehearsal Room 3, which is massive. And I’m talking huge. To give you a rough idea, I’d say it’s bigger than Truro but smaller than Scotland. Yes, that big. We started the day with a vocal and physical warm-up and cracked on with a bit of writing. Everyone wrote something, brought it back to the group and we worked through them all, putting each piece on its feet, one of us stepping out each time to direct the rest of the group in doing so. We did the same with both ideas. We wanted to be as democratic as possible, giving them both a fair crack of the whip before we allowed any bias to manifest. At the end of the day, we all had a different favourite idea now, but we kept that to ourselves too. Sunday. The day of rest. Not for the Narwhal Ensemble. Whilst you’re sleeping, we’re working. Whilst you’re eating, we’re working. (That’s a Will Smith quote, not one of ours. I reiterate; please don’t sue us). With Nik (the fourth best bowler at the Theatre Royal Plymouth) due to arrive in the afternoon to feedback on what we had come up with, Emma and Nicole stepped out to direct and we began to weave together a few of the scenes we had worked out on Saturday for both ideas. We showed these back to Nik in the afternoon and, armed with his feedback, began deliberating over which idea we were going to carry forwards. The discussion was long and, you guessed it, pensive. Nah, I can’t tell you. The last thing I need is eight angry Narwhals after me. 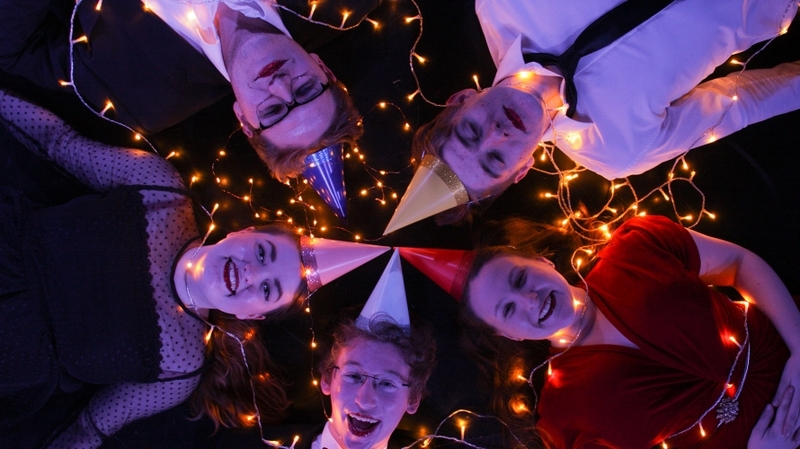 >> Find out more about our current Lab Company, The Narwhal Ensemble.